Just when I thought I was the last one left who frowned upon bad manners and bad behavior, I'm proved wrong. There is someone else! Someone who has the guts to speak up and say what's not acceptable (too many people are too afraid to say NO) and what is. The celebrated Tim Gunn was a design teacher and is now seen on the reality television show Project Runway as well as working for the Liz Claiborne empire. In his book he imparts his personal thoughts and feelings on good manners (yay!) and how to bite the bullet and just "make it work". He relates stories of participants on the show and of students in class, who, like us all, come up against more than a few stumbling blocks in life. His approach is not to scrap it all and start over, but to rather tweak and fix what you've already accomplished. Tim's my kinda man. [It's so much easier to be nice to people; it's less stressful and is less work.] He and I agree on so much we could be one person. However, I don't have as many stories as he does about bad behavior, and his are often about well known celebrity-types who misbehave in public. (Martha Stewart and her daughter Alexis, certain flight attendants, etc.) — Shocking! He also has hair-raising stories of non-celebrity-types who think they're more important than they are (Vogue crew as an example, or the the 13-year-old in Saks), that will make your hackles rise, and then fall as you enjoy his wit at their expense. I'm so glad he's called these people out — no one is "better" than the next person. His stories include his careers, schooling, friends and colleagues, his travels, family, the fashion world and more. But, more importantly, are his 18 "rules" which constitute his book, and he unleashes his views amongst his very sage and worthwhile advice on manners and etiquette, grooming, house guests (I'm completely in agreement) and much more. It's so natural to be nice that it's frightening so many people can't be civil. Instead, they're obnoxious, loud, dismissive, rude, condescending, and full of their own importance. Yucky. 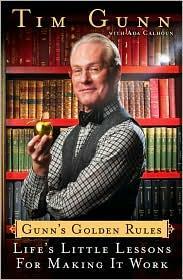 I completely agree with everything Mr. Gunn has to say, and only wish that everyone would read this book. His rules would translate well for politicians as well as designers, or anyone in lofty positions. It's not necesssary (or nice) to be so rude and thoughtless. Conclusion - I love, love, love this book, hence the check mark as my highest recommedation. After this book you'll have the confidence to avoid-like-the-plague people in your circles. A definite must-read!